A redesigned Q60 will arrive for the 2017 model year. Infiniti remains on course with a full slate of new models that it revealed over the last year, scheduled to roll out between early 2016 and 2018. The luxury brand is using its expanding partnership with Germany's Daimler to develop three as-yet-unidentified compact models along with the engine families inside them. Starting in late 2017, Infiniti will begin obtaining those models out of a plant now under construction in Aguascalientes, Mexico. Daimler also will obtain three compact Mercedes-Benz models from the plant. Infiniti also envisions a higher-end luxury sedan and coupe in the coming three years. Q30: The first product out of the chute in Infiniti's campaign will arrive next spring as the Q30. The 2017 model year compact hatch will be produced in England using the Mercedes-Benz MFA architecture, which yields the Mercedes A class. The sporty model represents a new segment for Infiniti. Q60: Next summer, a redesigned Q60 coupe will arrive for the 2017 model year to replace the compact previously marketed as the G37 coupe. The new Q60 will share the architecture of the Q50 sedan. Infiniti will not offer a 2016 Q60. 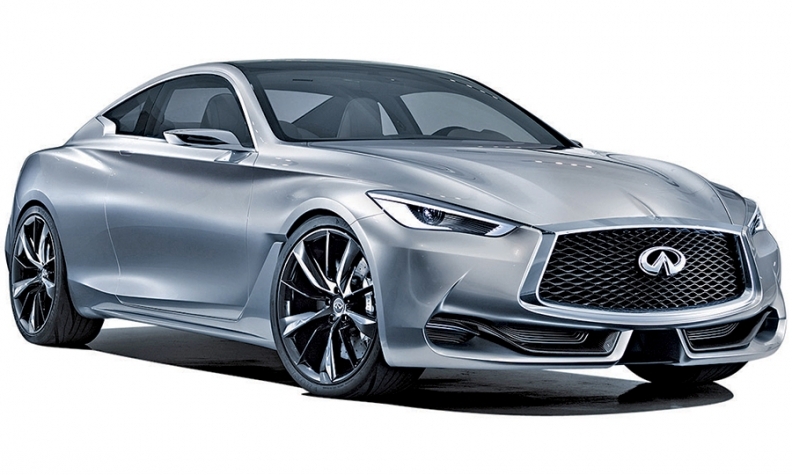 Infiniti previewed the design with the Q60 concept at the 2015 Detroit auto show. Q50: The brand's volume-leader will receive an optional 2.0-liter, direct-injection, turbocharged four-cylinder engine in 2016. The engine was designed by Daimler. Q40: The previous-generation G37 sedan, marketed as Infiniti's entry-level Q40, will be discontinued for 2016. QX30: A crossover version of the Q30 will arrive in U.S. showrooms in the second half of 2016. The rear-wheel-drive model will use a Mercedes-designed 2.0-liter, turbocharged, four-cylinder engine. QX50: The smallest of Infiniti's crossovers until the QX30's arrival, the QX50 takes on more size for 2016, with an extended wheelbase. The 3.2-inch lengthening translates to nearly 7 inches of additional rear-seat room. Q80: Infiniti will create a full-size four-door fastback in 2018 or 2019, positioned to compete against the Porsche Panamera. The hybrid-powertrain car -- presented as the Q80 Inspiration at the fall 2014 Paris auto show -- is longer, wider and lower than the brand's current flagship, the Q70. Q70: There will be no changes this year for the Q70, which was freshened for 2015. QX80: The full-size SUV carries over from a 2015 model year face-lift. A more significant redesign likely will come in 2018. QX70: A redesign is likely for late 2018 or early 2019. QX60: A product freshening will come for the 2017 model year. Q50 Eau Rouge: Infiniti has backed away from its plan to create this $100,000-plus high-performance version of the Q50 sedan. The company has not officially killed the concept, which would have used Nissan's 560-hp GT-R V-6, but officials say more mainstream luxury models have a higher priority. Infiniti LE: Originally proposed as a rebadged Nissan Leaf, the on-again-off-again Infiniti electric car is back in the longer-range product plans for now. Nissan executives recently told shareholders that the automaker is developing an electric-vehicle battery system that could provide a driving range of more than 300 miles per charge. 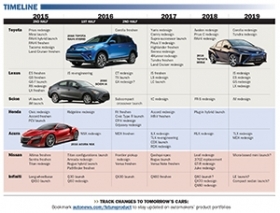 The likely 2018-19 time frame for that technology is a likely bet for the Infiniti EV.